Kanuti National Wildlife Refuge’s weed pulls on the Haul Road have taken place every summer since August 2006 with dozens of Friends volunteering for the 24 opportunities. After that initial project involving various agencies such as USFWS, BLM, NPS, AmeriCorps, and others, weed pulls occurred twice each year until June 2018 from the Kanuti River MP 105.8 (just south of the Arctic Circle) north to most recently the Dietrich River MP 207(north of the community of Wiseman), more than 100 miles. Recent efforts to eliminate all seed production were concentrated on all river crossings and culverts which moved westward toward the Kanuti Refuge. 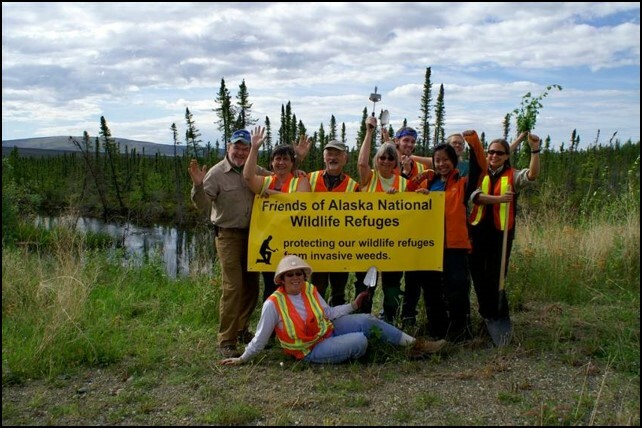 Staff and Friends of Alaska National Wildlife Refuges (Friends) and others were concerned these waterways would become routes for dispersal of invasive White Sweet clover (Melilotus alba) into the Refuge. This non-native plant readily invades open and disturbed areas and has established extensive areas along early successional, gravel river bars elsewhere in Alaska and rapidly colonized the Dalton Highway corridor. 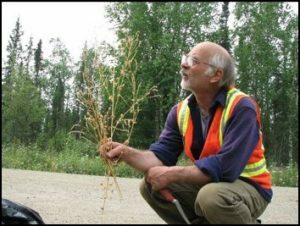 In addition, invasive Bird Vetch (Viccia cracca) is growing within the Dalton Highway Corridor and downriver. These populations are all expanding. Control efforts have focused on manual pulling, but have also included mechanical and cultural control. The current political climate has resulted in decreased funding for refuges and other public lands. This translated to many staffing shortages and cuts to various programs each year. Now this shortage has made it impossible to continue the project in 2018. 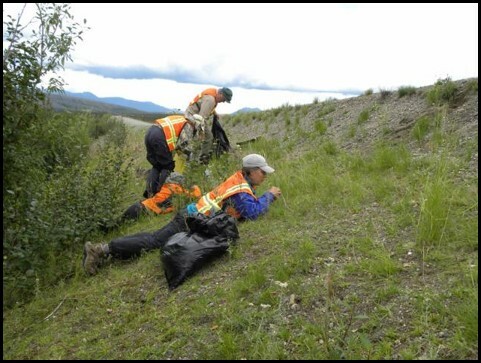 Additionally, refuge staff indicate future efforts may include conducting early detection/rapid response surveys along rivers downstream of the Dalton Highway and within the Refuge so any newly established colonies of invasive plants can be controlled and eliminated quickly. They hope to involve Friends as these plans are developed so that there may be some volunteer opportunities in 2019. During the 14 years volunteers signed on to work outside along the highway removing white sweet clover and bird vetch for long hours in dirty, dusty, hot or cold, wet or dry, occasionally smoky, and frequently buggy conditions, sleeping in dry cabins, going without showers. Many returned to do it all again as the benefits were tremendous, primarily having the experience of just being up there. There were opportunities for berrying, wildlife viewing, fishing, cooling off in the rivers, hiking, traveling to the grandeur of Atigun Pass, visiting Wiseman, Galbraith Lake, and Toolik Lake, and spending time in the Arctic Interagency Visitor Center (AIVC) chatting to Haul Road tourists about refuges. And then there was the food! Huge burgers and pulled pork sandwiches and shakes at the Hot Spot on the drive from Fairbanks to Coldfoot; breakfast and lunch makings and snacks provided by the refuge; and those fantastic Coldfoot Camp Buffets for dinner! Perhaps the biggest rewards were the friendships that developed over the shared experiences: Staff from all three Fairbanks refuges, AIVC staff, and Friends volunteers worked side by side, from managers to seasonal interns, volunteers from age 16 to “in the 70s”, all with a commitment to protect our public lands and our wildlife for ourselves and future generations. While I’m sad for this project to end suddenly, I look forward to hearing about alternative projects for monitoring/control. Stay tuned!